An American football running back for the Atlanta Falcons of the National Football League is named as Devonta Freeman. He was drafted by the Falcons in the fourth round of the 2014 NFL Draft. He played college football at Florida State. He is a very outstanding as well as a talented player for the Atlanta Falcons. He plays by wearing shirt number of 24. 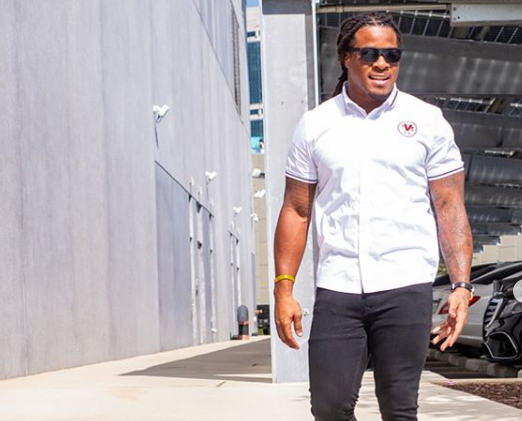 Falcons star Devonta Freeman headed to injured reserve as injuries pile up in Atlanta. A Falcons roster that has been devastated by injuries this year has just taken another hit. 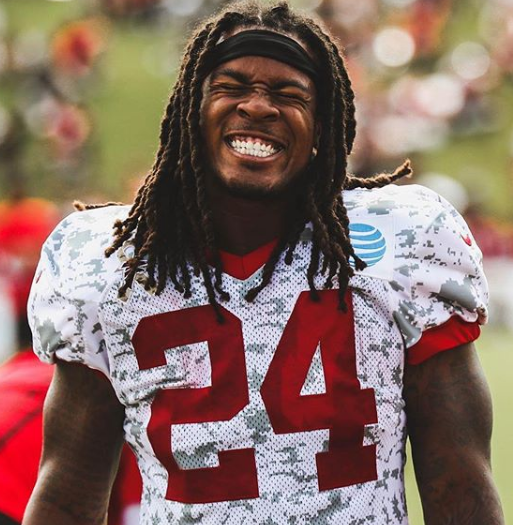 The team announced on Tuesday that running back Devonta Freeman will be placed on injured reserve. The move comes as somewhat of a surprise and that's because Falcons coach Dan Quinn gave no indication that Freeman might miss an extended amount of time. Quinn met with the media on Monday and said that Freeman would "likely" miss the team's Week 7 game against the Giants. The decision to put Freeman on injured reserve will almost certainly end his season, although there's a chance that he could return to the team in late December, a move that the Falcons would likely only make if they're still in contention. Freeman has been battling injuries all year. In the Falcons' opener against the Eagles, the running back suffered a knee injury that ended up sidelining him for three weeks. The 26-year-old then returned in Week 5, only to suffer multiple injuries (groin, foot) in a 41-17 loss to the Steelers. Due to those two injuries, Freeman sat out of Atlanta's 34-29 win over the Buccaneers on Sunday. The Atlanta Falcons running back is having groin surgery and will be placed on injured reserve. Devonta Freeman was born to Lorraine Freeman (mother) and Alfonso Nails (father) on 15th March 1992, in Baxley, Georgia, in the United States. His nationality is American. He lost his aunt when he was 14 years old. Her name is Tamekia N. Brown. She died at the age of 24. In honor of his aunt, Freeman tattooed her name on his left arm and now wears jersey number 24. His horoscope sign is Pisces. Talking about his education, he attended Miami Central High School, located in West Little River, in Florida. During his days at Miami, he was part of the school’s football team called the Rockets. In his junior year, he helped the team to win the Class 6A state championship held in 2010 and was listed as the MVP. Devonta has got attractive body features. He looks very handome with a charming face which attracts a lot of followers towards him. His body build is athletic. Talking about his height and weight, he stands 1.73 m tall with the balanced weight of 93 Kg. His other body measurement such as chest size, waist size, eye color will be updated soon. Devonta started his career in football by playing at college for Florida State from the year 2011 to 2013. In the year 2011, he played as a freshman against Louisiana-Monrow where he had 24 rushing yards and his first collegiate rushing touchdown. Later, he played against Duke, Maryland, North Carolina State, Boston College, Florida Gators and many more very brilliantly. His 2012 season was the season of his Sophomore where he had 69 rushing yards and a rushing touchdown against Savannah State. On 11th January 2014, he announced he would forego his senior season and enter the 2014 NFL Draft. Devonta was drafted by the Atlanta Falcons in the fourth round (103rd overall) of the 2014 NFL Draft. In his 2014 rookie season, he played against New Orleans Saints and later with Detroit Lions and more. He appeared in all 16 games during his rookie season where he accumulated 248 rushing yards on 65 carries, 225 receiving yards on 30 receptions, one rushing touchdown, and two receiving touchdowns. He started his 2015 season against Philadelphia Eagles in the season opener on Monday Night Football. He was selected to the Pro Bowl, the first of his career, and was named a Second-team All-Pro. Freeman was ranked as the 50th best player in the NFL and the fifth best running back by his fellow players on the NFL Top 100 Players of 2016. He entered the 2016 season playing against New Orleans Saints where he had 14 carries for 155 yards and five receptions for 55 yards and a touchdown. After that, he played against Carolina Panthers, Arizona Cardinals, Kankas City Chiefs, New England Patriots and many more. In Super Bowl LI, where the Falcons lost 34-28 in overtime to the New England Patriots where he would have 11 carries for 75 yards, two receptions for 46 yards, and scored the first points for either team on a rushing touchdown in the second quarter. He was ranked as the 41st best player in the NFL and the sixth best running back by his fellow players on the NFL Top 100 Players of 2017. He signed a five-year, $41.25 million contract extension with the Falcons to become the highest paid running back in the NFL on 9th August 2017. He played against Chicago Bears, Green Bay Packers, Detroit Lions, Buffalo Bills, New Orleans Saints, Tampa Bay Buccaneers, Carolina Panthers, Atlanta Falcons in his 2017 seasons. In the Wild Card Round, he along with his team played against the Los Angeles Rams where he had 66 rushing yards and a rushing touchdown in the 26-13 victory. In the Divisional Round, he had a receiving touchdown in the 15-10 loss. The touchdown marked Freeman's fifth consecutive postseason game with a touchdown. Devonta is not married yet but he is in a relationship with Luther Campell. Luther Campell is the former leader of the music group 2 Live Crew. The lovebird is living a happy life each other. There is no any sign of separation between them. The couple has no child till now. They are living a peaceful life and spending blissful moments together. The couple is spotted time again time and they are enjoying their life fully. He lost his aunt when he was 14 years old. Her name is Tamekia N. Brown. In honor of his aunt, Freeman tattooed her name on his left arm. In his junior year, he helped the team to win the Class 6A state championship held in 2010 and was listed as the MVP. Devonte was drafted by the Atlanta Falcons in the fourth round (103rd overall) of the 2014 NFL Draft.